Innovation in aerospace design and engineering is essential to meet the many challenges facing this sector. Innovation in aeronautics explores both a range of innovative ideas and how the process of innovation itself can be effectively managed. After an introduction to innovation in aeronautics, part one reviews developments including biologically-inspired technologies, morphing aerodynamic concepts, jet engine design drivers, and developments underpinned by digital technologies. The environment and human factors in innovation are also explored as are trends in supersonic passenger air travel. Part two goes on to examine change and the processes and management involved in innovative technology development. Challenges faced in aeronautical production are the focus of part three, which reviews topics such as intellectual property and patents, risk mitigation and the use of lean engineering. Finally, part four examines key issues in what makes for successful innovation in this sector. 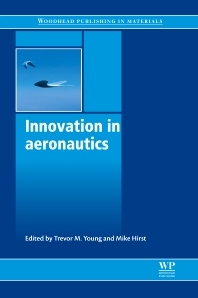 With its distinguished editors and international team of expert contributors, Innovation in aeronautics is an essential guide for all those involved in the design and engineering of aerospace structures and systems. 6.5 What determines the value of the energy liberated to revenue work ratio (ETRW)? Trevor Young is Senior Lecturer in Aeronautical Engineering at the University of Limerick, Ireland. Mike Hirst is a Senior Associate with Airport Planning and Development Ltd, Leeds, UK. He is a chartered engineer and aviation systems specialist with some 40 years’ experience in civil aviation, including flight testing, air traffic control and systems, airport design, and operations training, education and research.